In light of what is taking place in the world today bad behavior had become all to common place. But the most disturbing thing about this is that people have joined forces with one another to justify their bad behavior by justifying the bad behavior of others. The biggest excuse that is being used is that other people are doing it so that makes it ok if I do it. The problem with that is that they are using the wrong standards. They are using a standard that is man’s standard and not Gods. In order to understand this let’s look at what the definition of an enabler is. Wikipedia describes enabling in this way. As a positive term, “enabling” is similar to empowerment, and describes patterns of interaction which allow individuals to develop and grow. These patterns may be on any scale, for example within the family, or in wider society as “enabling acts” designed to empower some group, or create a new authority for a (usually governmental) body. In a negative sense, “enabling” can describe dysfunctional behavior approaches that are intended to help resolve a specific problem but in fact may perpetuate or exacerbate the problem. A common theme of enabling in this latter sense is that third parties take responsibility or blame, or make accommodations for a person’s harmful conduct (often with the best of intentions, or from fear or insecurity which inhibits action). The practical effect is that the person himself or herself does not have to do so, and is shielded from awareness of the harm it may do, and the need or pressure to change. Enabling in this sense is a major environmental cause of addiction. Common examples of enabling can be observed in the relationship between the alcoholic/addict and a codependent spouse or a parent. The spouse may attempt to shield the addict from the negative consequences of their behavior by calling in sick to work for them when they are hungover or binging on substances, making excuses that prevent others from holding them accountable, and generally cleaning up the mess that occurs in the wake of their impaired judgment. In reality, what the spouse is doing may be hurting, not helping. Enabling can tend to prevent psychological growth in the person being enabled, and can contribute to negative symptoms in the enabler. Therapist Darline Lancer writes, “Stopping enabling isn’t easy. Nor is it for the faint of heart. Aside from likely pushback and possible retaliation, you may also fear the consequences of doing nothing. For instance, you may fear your [addict] husband will lose his job…You may be afraid the addict may have an auto accident, or worse, die or commit suicide.” The parent may allow the addicted adult child to live at home without paying rent or helping with chores, constantly give the child money, and be manipulated by the child’s excuses, emotional attacks, and threats of self-harm. Darlene Albury, an LMSW who has a Bachelors Degree specializing in Human Services and counseling, and Masters Degree in Clinical Social Work has this to say about enablers. An enabler is a person who by their actions make it easier for anyone to continue their self-destructive behavior by criticizing or rescuing. The term codependency refers to a relationship where one or both parties enable the other to act in certain maladaptive ways. Many times, the act of the enabler satisfies a need for the codependent person because his or her actions foster a need from the other person or persons in the relationship. To enable the individual with the addiction, the mutually dependent person makes excuses and lies for the addict, which enables the addiction to continue. Codependency is reinforced by a person’s need to be needed. The enabler thinks unreasonably by believing he can maintain healthy relationships through manipulation and control. He believes he can do this by avoiding conflict and nurturing dependency. Is it normal for someone to think that he can maintain a healthy relationship when he does not address problems and he lies to protect others from their responsibilities? The way a codependent person can continue to foster this dependency from others is by controlling situations and the people around them. The ongoing manner of a codependent home is to avoid conflicts and problems and to make excuses for destructive or hurtful behavior. • Any of a number of other unhealthy behaviors/patterns of addiction. Any time you assist/allow another person to continue in their unproductive/unhealthy/addictive behavior, whether actively or passively, you are enabling. Even when you say nothing you are enabling the behavior to continue. Sometimes you say nothing out of fear, fear of reprisal, fear of the other person hurting, hating, not liking you; or fear of butting in where you don’t think you belong. Perhaps even fear of being hit or worse. Sometimes enabling takes the form of doing something for another that they should do for themselves. It also takes the form of making excuses for someone else’s behavior. Example: There are situations where the spouse of an alcoholic will call in to the boss to say that person is “sick,” when they are really too hung over they can’t make it to work. You more than likely enable out of your own low self-esteem. You haven’t gained the ability to say no, without fear of losing the love or caring of that other person. People who learn tough love have to learn that their former behaviors have been enabling and that to continue in them would represent allowing the other person’s pattern of behavior to continue and to worsen. It is difficult to stop enabling if you’re trying to do it with all authority. And it’s not easy until you know you deserve to stop. Until you know that you are endearing regardless of what the person you’ve previously enabled says to the contrary and until you raise your own self-esteem enough to be that strong. You may think it’s the other person who needs all of the help, in truth, you both do. Before examining this any further it is very important to understand what God has to say about enabling. Not just for those who justify their own bad behavior but those who also justify the bad behavior of others. This is because this is the standard that He holds us to. 16 because it is written, “Be holy, for I am holy. This is something that man has constantly tried to use as an excuse to continue in their actions. They don’t believe that they can or don’t have any desire to live up to this standard so they simply continue in their folly. The book of Proverbs describes man’s behavior very clearly. Starting with the very first chapter. To perceive the words of understanding, 3 To receive the instruction of wisdom, Justice, judgment, and equity; 4 To give prudence to the simple, To the young man knowledge and discretion— 5 A wise man will hear and increase learning, And a man of understanding will attain wise counsel, 6 To understand a proverb and an enigma, The words of the wise and their riddles. 7 The fear of the LORD is the beginning of knowledge, But fools despise wisdom and instruction. Let us lurk secretly for the innocent without cause; 12 Let us swallow them alive like Sheol, And whole, like those who go down to the Pit; 13 We shall find all kinds of precious possessions, We shall fill our houses with spoil; 14 Cast in your lot among us, Let us all have one purse”— 15 My son, do not walk in the way with them, Keep your foot from their path; 16 For their feet run to evil, And they make haste to shed blood. 17 Surely, in vain the net is spread In the sight of any bird; 18 But they lie in wait for their own blood, They lurk secretly for their own lives. 19 So are the ways of everyone who is greedy for gain; It takes away the life of its owners. As is the theme of Proverbs it starts off with exhorting mankind to seek wisdom and understanding. Not man’s understanding but God’s understanding. There are both positive exhortations and negative warnings throughout not only the Book of Proverbs but also throughout the bible. But Proverbs is very explicit in its dealing with the foolishness of man. God knows all too well about man’s foolishness. Romans 1 also makes that clear. 18 For the wrath of God is revealed from heaven against all ungodliness and unrighteousness of men, who suppress the truth in unrighteousness, 19 because what may be known of God is manifest in them, for God has shown it to them. 20 For since the creation of the world His invisible attributes are clearly seen, being understood by the things that are made, even His eternal power and Godhead, so that they are without excuse, 21 because, although they knew God, they did not glorify Him as God, nor were thankful, but became futile in their thoughts, and their foolish hearts were darkened. 22 Professing to be wise, they became fools, 23 and changed the glory of the incorruptible God into an image made like corruptible man—and birds and four-footed animals and creeping things. 24 Therefore God also gave them up to uncleanness, in the lusts of their hearts, to dishonor their bodies among themselves, 25 who exchanged the truth of God for the lie, and worshiped and served the creature rather than the Creator, who is blessed forever. Amen. 26 For this reason God gave them up to vile passions. For even their women exchanged the natural use for what is against nature. 27 Likewise also the men, leaving the natural use of the woman, burned in their lust for one another, men with men committing what is shameful, and receiving in themselves the penalty of their error which was due. 28 And even as they did not like to retain God in their knowledge, God gave them over to a debased mind, to do those things which are not fitting; 29 being filled with all unrighteousness, sexual immorality, wickedness, covetousness, maliciousness; full of envy, murder, strife, deceit, evil-mindedness; they are whisperers, 30 backbiters, haters of God, violent, proud, boasters, inventors of evil things, disobedient to parents, 31 undiscerning, untrustworthy, unloving, unforgiving, unmerciful; 32 who, knowing the righteous judgment of God, that those who practice such things are deserving of death, not only do the same but also approve of those who practice them. There is another definition that we must look at. That is the definition of what cognitive bias is. A cognitive bias is a mistake in reasoning, evaluating, remembering, or other cognitive process, often occurring as a result of holding onto one’s preferences and beliefs regardless of contrary information. Psychologists study cognitive biases as they relate to memory, reasoning, and decision-making. Many kinds of cognitive biases exist. For example, a confirmation bias is the tendency to seek only information that matches what one already believes. Memory biases influence what and how easily one remembers. For example, people are more likely to recall events they find humorous and better remember information they produce themselves. People are also more likely to regard as accurate memories associated with significant events or emotions (such as the memory of what one was doing when a catastrophe occurred). This is a reasoning by which people seek out others who will help them justify their behavior. There is a saying that water will take the path of least resistance. This is the same with people who behave badly. With all of the temptations that the world has to offer this is the easiest path for people to take. It is easy to behave badly. People just want to have fun and be entertained. That is why It is so easy for the American government to take away more and more freedom from us with every law they place on the books. Mistakenly people believe that if it does not effect them then it does not matter. In his article titled “The Fall of the Republic” Lawrence Reed talks about how everything that the government does effect’s us all. This is not only bad behavior by individuals but by government as well. 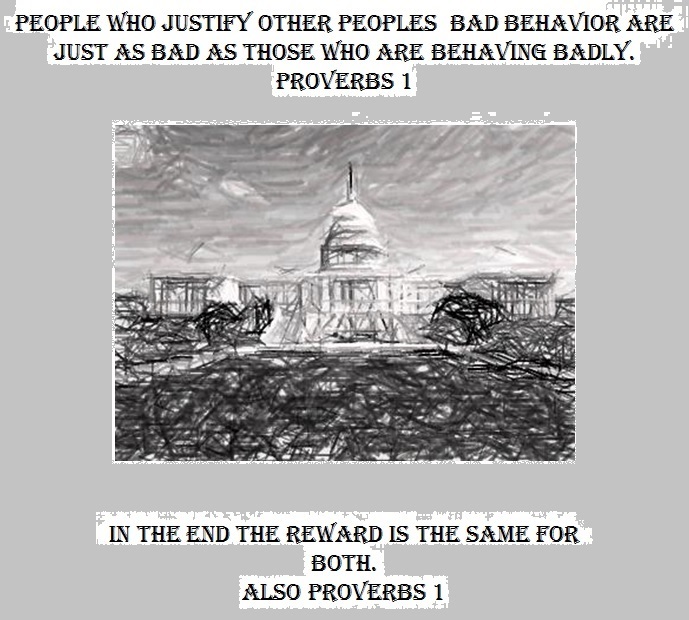 People joining together, as it say’s in Proverbs 1, to justify their bad behavior. For nearly five centuries, Res Publica Romana—the Roman Republic—bestowed upon the world a previously unseen degree of respect for individual rights and the rule of law. When the republic expired, the world would not see those wondrous achievements again on a comparable scale for a thousand years. In print and from the podium, I have addressed the calamitous economic policies that ate away the vitals of Roman society. I’ve emphasized that no people who lost their character kept their liberties. But what about the republic as a form of governance—the structure of representation, the Senate and popularly elected assemblies, laws for the limitation of power and protection of property, and the Roman Constitution itself? Did those ancient institutions abruptly disappear or were they eroded through “salami tactics,” one slice at a time? It behooves us to know the reasons the republic died. Philosopher George Santayana’s general dictum famously tells us why we should know them: “Those who cannot remember the past are condemned to repeat it.” But there is a more specific and immediate urgency to learning the facts of Roman misfortune: In eerie and haunting ways, Americans at this very moment are living through a repetition of Rome’s republican decay. No single person, domestic law or foreign intervention ended the Republic in a single stroke. Indeed, the Romans never formally abolished the republic. Historians differ as to when the actual practice of republicanism ended. Was it when the Senate declared Julius Caesar dictator for life in 44 B.C.? Was it in 27 B.C., when Octavian assumed the audacious title of “Caesar Augustus”? In any event, the Senate lived on until the collapse of the Western Roman Empire in A.D. 476, though after Augustus it never amounted to much more than an imperial rubber stamp. The Roman Republic died a death of a thousand cuts. Or, to borrow from another, well-known parable: The heat below the pot in which the proverbial frog was boiled started out as a mere flicker of a flame, then rose gradually until it was too late for the frog to escape. Indeed, for a brief time, he enjoyed a nice warm bath. Like the American Republic, the Roman one was born in violent revolt against monarchy. “That’s enough of arbitrary and capricious one-man rule!” Romans seemed to declare in unison in 509 B.C. Rejecting kings is a supremely rare thing in human history. The Romans dispersed political power by authorizing two coequal consuls, limited to one-year terms and each with a veto over the acts of the other. They created a Senate in which former magistrates and members of patrician families with long civil or military service would sit. They set up popularly elected assemblies that gained increasing authority and influence over the centuries. Due process and habeas corpus saw their first widespread practice in the Roman Republic. Freedoms of speech, assembly, and commerce were pillars of the system. All of this was embodied in the Roman Constitution, which—like that of the British in our day—was unwritten but deeply rooted in custom, precedent, and consensus for half a millennium. Roman freedom and republican governance, to be sure, were undercut by limitations on the franchise and on the always detestable institution of slavery. The Roman Republic was certainly not perfect, but still it represented a remarkable advance for humanity, as could be said of the Magna Carta or the Declaration of Independence. Writers from the first centuries B.C. and A.D. offered useful insights to the decline. Polybius predicted that politicians would pander to the masses, leading to the mob rule of an unrestrained democracy. The constitution, he surmised, could not survive when that happened. Sallust bemoaned the erosion of morals and character and the rise of personal power lust. Livy, Plutarch, and Cato expressed similar sentiments. To the moment of his assassination, Cicero defended the Republic against the assaults of the early dictators because he knew they would transform Rome into a tyrannical despotism. Ultimately, the collapse of the political order of republican Rome has its origins in three developments that took root in the second century B.C., then blossomed by the end of the first. One was foreign adventure. The second was the welfare state. The third was a sacrifice of constitutional norms and the rule of law to the demands of the other two. In his excellent 2008 book, Empires of Trust, historian Thomas F. Madden argues that much of the expansionism of the Roman Republic was defensive in nature—that is, the Romans gradually accumulated an empire without any real design to have one. But there is no doubt that after the wars with Carthage (ending in the middle of the second century B.C), the burdens of policing vast territory from one end of the Mediterranean to the other were costly. Wars also gave excuses to political leaders to spy and conspire, to suspend constitutional provisions in the name of national emergencies. As power concentrated in the hands of military figures, men in service increasingly placed loyalty to their generals ahead of loyalty to the general welfare. Taxes were raised even as the booty (and slaves) from overseas conquests poured in. If Rome had stayed home, its military-industrial complex might have been better tamed. Foreign conflicts produced another ill effect at home. Many peasants saw their lands ravaged while they were off at war for long periods. And if they still possessed them upon return, they found they had to compete with the cheap labor of the slaves captured in war and put to work by wealthy landowners with political connections. If Romans by the first century B.C. still cared about the institution of limited, representative government, increasing numbers of them could simply be bribed into compliance using subsidies. To fix the economic injustices that war and other interventions created, reformers in the second century B.C. proposed redistribution of land by law. The Gracchus brothers rose to power on just such promises, and though their efforts ended in their assassinations, the principle of robbing Peter to pay Paul caught hold. In 59 B.C., a man named Clodius ran for the important office of tribune on a platform of free wheat for the masses, and won. He was among the first in a long line of demagogues bearing gifts from the public treasury. At this point, “Kershner’s First Law” (named for the late economist Howard E. Kershner) kicked in: “When a self-governing people confer upon their government the power to take from some and give to others, the process will not stop until the last bone of the last taxpayer is picked bare.” Eventually the central government bailed out profligate cities and provinces, spent huge sums to keep the people entertained, and even issued zero-interest credit to thousands of private businesses in a misguided effort to “stimulate” a sputtering economy. Warfare plus welfare equals massive revenue needs. Taxes went up but with an interesting twist: The Roman government turned to the private sector to perform much of its tax collecting, legalizing almost any tactic to get the money and giving a large cut to those who got it. The ruthlessness of government was combined with the efficiency of the private sector to produce a crushing and inescapable burden. Even so, by the middle of the first century A.D., deficits and debt led the government to commence a systematic, long-term depreciation of its currency. The silver and gold content of Roman coins eventually evaporated. Long after the republic expired and the empire was entering its twilight, public welfare was enshrined as a right, not a mere privilege or temporary assist. People were even frozen by law in their professions so that no one could escape the government’s taxes or wage and price controls by changing occupations. For several hundred years, the unwritten Roman Constitution boasted features we would recognize today: checks and balances, the separation of powers, guarantee of due process, vetoes, term limits, filibusters, habeus corpus, quorum requirements, impeachments, regular elections. They were buttressed by the traits of strong character (virtus) that were widely taught in Roman homes: gravitas (dignity), continentia (self-discipline), industria (diligence), benevolentia (goodwill), pietas (loyalty and a sense of duty), and simplicitas (candor). Romans knew well that the rules of their constitution were there for good reason and until they were bribed with public money to cast them aside, they frowned on anyone who sought to violate them. Lesser offices such as magistrate, praetor, censor, aedile, quaestor, and tribune were eventually abandoned in favor of the very one-man rule the republic was founded to replace. Popular assemblies became irrelevant. The Senate evolved into a worthless advisory body of corrupt cronies who cared more for their privileges than for their purpose. By the time the Romans lost it all to foreign barbarians in A.D. 476, the constitution that had once enshrined their liberties was a distant dead letter. Does any of this story ring familiar? You’d have to be asleep if it doesn’t. Our own Constitution, barely two centuries old, is in shambles. When Iraq was writing a new one a few years ago, the late night comedian Jay Leno quipped, “Why don’t we just give them ours? We’re not using it.” It was a remark more tragic than funny. The “commerce clause” of our Constitution has been twisted and bent until it now justifies almost any intervention from the central government. A Supreme Court chief justice performed the most amazing intellectual gymnastics to sanctify a health care monstrosity as constitutional. Our President rewrites the law as he pleases. He makes “recess appointments” when the Senate is not in recess. He issues executive orders by the hundreds. He presides over agencies that spy on millions of Americans and target political enemies for retribution. But I don’t mean to single out Barack Obama. He’s simply extending a legacy that goes back many years now. What raises the ire of Americans enough to bring them out into the streets is not an arbitrary breach of constitutional norms but simply the hint that some benefit might be cut back. Tells you something about our priorities these days, doesn’t it? The catalog of constitutional erosions is fat and getting fatter. My limited intention here is to shake a few people awake and get them to start thinking. I urge the reader to take another look at the Constitution and compile a list of instances of our leaders’ careless and shameless abdication of its prescriptions. Decide for yourself if history is truly repeating itself. We know the path the Romans took, so we have no excuse for not learning from their experience. Do we really want to keep heading in the same direction? One of the things that eventually happens with this behavior is that there is always a fall guy for this kind of behavior. Hitler used the Jews to blame Germany’s problems on. Thus he believed he was was given the power by those who followed him to justify the killing of millions of people. Today we are seeing this same kind of behavior unfolding right before us. It is the same throughout history. Nations have fallen time and time again to tyrants because they have decided that is ok to behave this way. Lives have been destroyed time and time again by people who believe that it is ok to behave this way. People have used religion, love, hate, and a host of other excuses to condone their and others bad behavior. They do not seek to live up to God’s standards but prefer to take the low road because it is the path of least resistance. But in the end this kind of behavior has one reward. But the promise for holding on to God’s word is this. One last word about looking at things through God’s standards. Human beings are emotional beings. When we take our eyes off of God and start looking at things our way, we have a natural tendency to cause all kinds of damage to others. We want what we want and we do not care about the effect it has on others. And if you don’t stop looking at things through your own eyes and get them back on God and His standards then that damage very well could lead to something that last an eternity. 6 Seek the LORD while He may be found, Call upon Him while He is near. 7 Let the wicked forsake his way, And the unrighteous man his thoughts; Let him return to the LORD, And He will have mercy on him; And to our God, For He will abundantly pardon. 8 “For My thoughts are not your thoughts, Nor are your ways My ways,” says the LORD. 9 “For as the heavens are higher than the earth, So are My ways higher than your ways, And My thoughts than your thoughts.